If you’ve read my earlier blog articles you may remember that I came to my current appreciation of 1911 style pistols late in life. The gun that did it for me was a Ruger SR1911 Commander. A Commander-size 1911 is one with a full-size grip but with the barrel and slide shorted by 3/4 inch. This was done to make the gun a little easier to carry, especially if it is being carried as a concealed handgun. The Ruger Commander was not my first 1911. It was my fourth. The ones prior to it were a Taurus PT1911, a Colt 1991 and a Springfield Loaded Target Model. All of these were good guns, but for me they weren’t “carry” guns and I saw no reason to make them so. I was content carrying either a Springfield XDm or Smith & Wesson M&P, both in .45 ACP. But, I got a Ruger 1911 Commander and loved everything about it. I loved the way it looked, the way it felt and the way it shot. It was (is) 100% reliable and it’s accurate and easy for me to shoot. With the right holster and belt combination it’s easy to carry. The Ruger was followed by some others that are similar – a Colt XSE, a Remington R1 Carry Commander, a Sig 1911 Scorpion Carry Commander and a Smith & Wesson 1911 SCE Commander. The Smith & Wesson had become my favorite for several reasons, among them the bob-tail grip and the scandium/aluminum frame that made it at least 10 ounces lighter than the other Commanders. 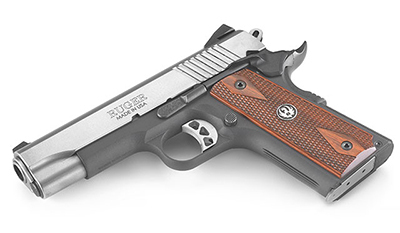 Now Ruger has come out with a lightweight model that matches the S&Ws weight. Here’s what it looks like. Beautiful, huh? It shoots like a dream. Last Saturday I shot a CHL qualify course (50 rounds at 9, 21 and 45 feet) plus 9 more, all using the Colt 8-round, flush-mount magazines I told you about in my last post. The close up rounds were all in one ragged hole and even as the target was moved out to the 45-foot line I was keeping all the rounds within the 9 and 10 ring. This was all free-hand with me standing. After shooting, I cleaned and lubed it and put it in my carry holster and that is where it has been every day since. My old pattern of rotating the carry gun every day or two has been suspended, at least for the time being. I really like having this new Ruger by my side. Not really related, but in approximately the same timeframe I changed my carry rig. The holster that has historically really worked well for me was a CrossBreed SuperTuck used with a Crossbreed gun belt. Every time I tried something different, I found myself coming back to the Crossbreed. But the instructors what work with us at Texas Gun Pros had been telling me about D. M. Bullard, a local leather goods manufacturer and the quality of holsters, magazine holders and gun belts made by this company. We made arrangements to carry these in our store and to make the special order ones available for our clients, so I figured I’d better try them. 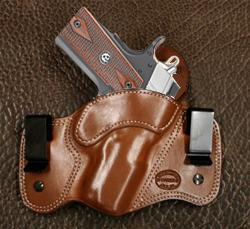 I got a Dual Carry holster for 1911s, designed so you can wear it inside or outside the waistband. Mine is set up for inside or IWB as we call it in the industry, and I’m using one of D. M. Bullard’s belts and an outside the waistband single mag carrier. That’s the holster shown to the right here. The belt is beautiful, thick leather and the magazine holder solved a problem I’d been having with my IWB mag carrier wearing a hole in my jeans from the inside. So I’ve become a user and promoter of D. M. Bullard’s leather goods, which you can find in our store or which we can special order for you if you have an unusual gun. Previous Previous post: Magazines – Who Wouldn’t Want More Rounds?